With six flexible meeting and event rooms, Radisson SAS Hotel, Belfast is ideal for small to mid-sized events, corporate meetings, private dining, indoor team building and evening entertainment such as Quiz Nights, Race Nights and Fun Casino Nights. Be sure to catch a live sporting event or tee off at one of the many golf courses nearby. 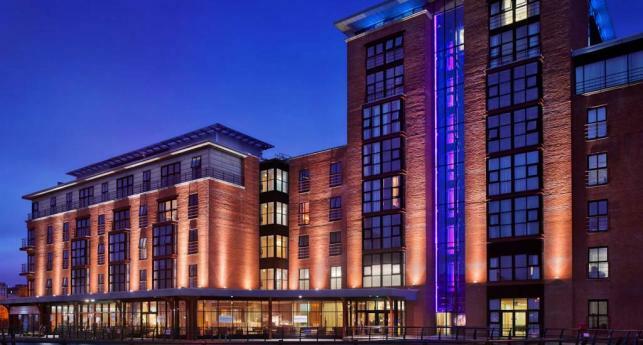 Situated in the revitalised Gasworks business area, our hotel combines a tranquil riverside setting with easy access to Belfast city centre. You can walk to shops and restaurants or travel to attractions like Titanic Belfast and the Botanic Gardens using public transport. An architecturally striking hotel in the centre of the newly regenerated urban area in Belfast, the Radisson SAS Hotel is as impressive as it is stylish. The Radisson SAS Hotel, Belfast is ideally located in the city centre, formally the Gasworks area. The hotel is close to the city and out of the way of its hustle and bustle, allowing our guests to have a good night's sleep and a good time out.